Arguably one of the greatest cities in America, Atlanta is a place full of excitement and rebirth! Since 2008, Paraclete XP Indoor Skydiving has welcomed thousands of guests from metro Atlanta in search of excitement and adventure! If you’re looking for places to go indoor skydiving near Atlanta, learn why people from the area are making the drive to our location in Raeford, NC. Please note: our address is 190 Paraclete Drive, Raeford, NC 28376 and we are located approximately 5.5 hours to the east of Atlanta, GA.
Paraclete XP is one of the largest wind tunnels in the world, and certainly the largest in the Southeast. 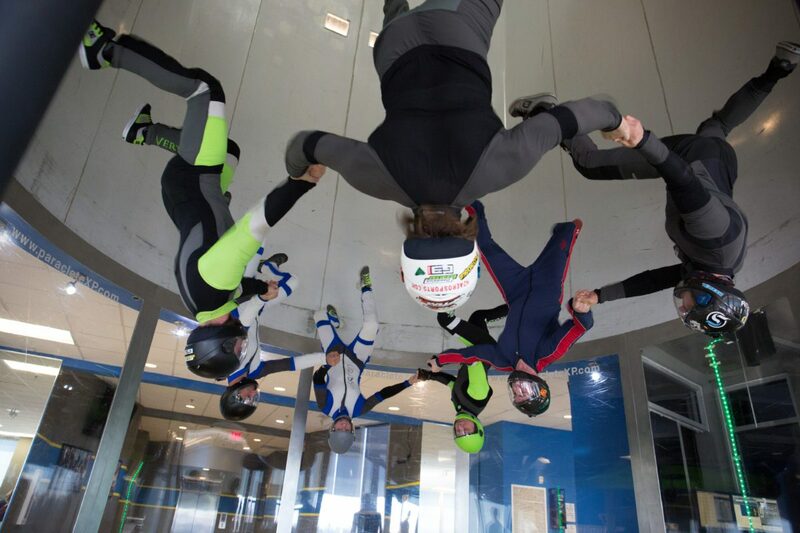 Standing at 53 feet tall and over 16 feet in diameter, our wind tunnel provides an ideal training environment for teams to practice 4-way and 8-way formation skydiving. We are also proud to be known as home to some of the world’s best skydiving teams and instructors. If you wish to train with the best, there’s no better place to do it. Our highly experienced staff of professionals genuinely enjoy what they do and love to share their passion for indoor skydiving with flyers of all experience levels! When you fly with us, we want your experience to be truly extraordinary. 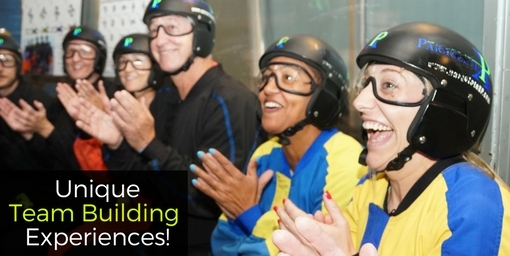 If it’s your first-time indoor skydiving, learn more about what to expect. If you don’t have tickets to a Braves or Falcons game and are looking for a great way to spend your weekend, why not book an indoor skydive and make a memory you’ll never forget! Want to learn more about indoor skydiving near Atlanta, GA? Check out what’s happening at Paraclete XP or contact us with any questions you have about finding a facility that’s right for you. Take I-20 E (Crossing into South Carolina). Merge onto I-95 N via EXIT 141A on the left toward Fayetteville (Crossing into North Carolina). Take the US-301 exit, EXIT 33, toward NC-71/Parkton. Turn left onto US-301 N/US Highway 301 N.
Turn left onto NC-71/NC Highway 71 N. Continue to follow NC-71. Turn right onto E 3rd St. Turn slight right onto Davis Bridge Rd. Davis Bridge Rd becomes Rockfish Rd. Turn right onto Lindsay Rd. Turn left onto Fayetteville Rd/US-401 S.
Turn right onto Brock Rd. Turn right onto Paraclete Dr.
Paraclete XP Indoor Skydiving, 190 Paraclete Dr, Raeford, NC, 190 PARACLETE DR is on the right.